Mutual funds are in the form of Trust (usually called Asset Management Company) that manages the pool of money collected from various investors for investment in various classes of assets to achieve certain financial goals. We can say that Mutual Fund is trusts which pool the savings of large number of investors and then reinvests those funds for earning profits and then distribute the dividend among the investors. In return for such services, Asset Management Companies charge small fees. Each Mutual Fund Scheme is managed by a Fund Manager with the help of his team of professionals. The Mutual Funds usually invest their funds in equities, bonds, debentures, call money etc., depending on the objectives and terms of scheme floated by MF. Now a days there are MF which even invest in gold or other asset classes. A mutual fund is required to be registered with Securities and Exchange Board of India (SEBI) which regulates securities markets before it can collect funds from the public. Costs: The investor pays fees as long as he remains with the fund. No tailor-made portfolios: High net-worth individuals may find this to be a constraint as they will not be able to build their own portfolio of shares. Managing a portfolio of funds: large number of funds can provide too much choice for the investor. He may need advice on how to select a fund. Delay in redemption: It takes 3-6 days for redemption of the units and the money to flow back into the investor’s account. A mutual fund is set up in the form of a trust, which has sponsor, trustees, asset management company (AMC) and custodian. The trust is established by a sponsor or more than one sponsor who is like promoter of a company. Asset Management Company (AMC) approved by SEBI manages the funds by making investments in various types of securities. Custodian, who is registered with SEBI, holds the securities of various schemes of the fund in its custody. The trustees are vested with the general power of superintendence and direction over AMC. They monitor the performance and compliance of SEBI Regulations by the mutual fund. Mutual funds are regulated primarily by Securities and Exchange Board of India (SEBI). 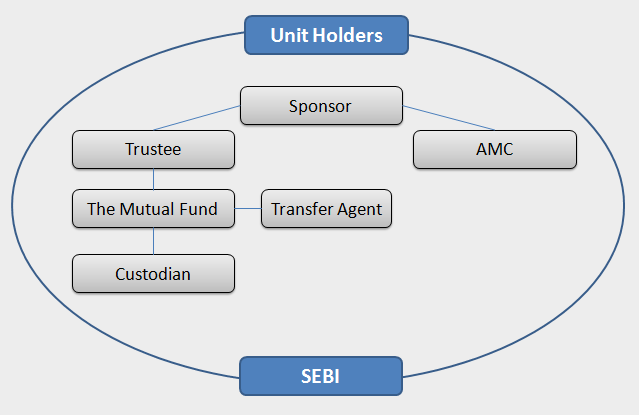 In 1996, SEBI formulated the Mutual Fund Regulation. SEBI is also the apex regulator of capital markets and its intermediaries. Issuance and trading of capital market instruments also comes under the purview of SEBI. Along with SEBI, mutual funds are regulated by RBI, Companies Act, Stock exchange, Indian Trust Act and Ministry of Finance. RBI acts as a regulator of Sponsors of bank-sponsored mutual funds, especially in case of funds offering guaranteed returns. In order to provide a guaranteed returns scheme, mutual fund needs to take approval from RBI. In addition, every mutual fund has a board of directors that represents the unit holders interests in the mutual fund. Mutual funds must set up AMC with 50% independent directors, a separate board of trustee companies with minimum 50% of independent trustees and independent custodians to ensure an arm’s length relationship between trustees, fund managers, and custodians. As the funds are managed by AMCs and the custody of assets are with trustees, a counter balancing of risks exists as both can keep tabs on each other. SEBI takes care of the track record of a Sponsor, integrity in business transactions and financial soundness while granting permission. The particulars of schemes are required to be vetted by SEBI. Mutual funds must adhere to a code of advertisement. As per the current SEBI guidelines, mutual funds must have a minimum of Rs. 50 crore for an open-ended scheme, and Rs. 20 crore corpus for the closed-ended scheme. Within nine months, mutual funds must invest money raised from the saving schemes. This protects the mutual funds from the disadvantage of investing funds in the bullish market and suffering from poor NAV after that. Mutual funds can invest a maximum of 25% in money market instruments in the first six months after closing the funds and a maximum of 15% of the corpus after six months to meet short-term liquidity requirements. SEBI inspects mutual funds every year to ensure compliance with the regulations. These funds invest exclusively in bGovernment securities have no default risk. NAVs of these schemes also fluctuate due to change in interest rates and other economic factors as is the case with income or debt oriented schemes. A Load Fund is one that charges a percentage of NAV for entry or exit. That is, each time one buys or sells units in the fund, a charge will be payable. This charge is used by the mutual fund for marketing and distribution expenses. Suppose the NAV per unit is Rs.10. If the entry as well as exit load charged is 1%, then the investors who buy would be required to pay Rs.10.10 and those who offer their units for repurchase to the mutual fund will get only Rs.9.90 per unit. The investors should take the loads into consideration while making investment as these affect their yields/returns. However, the investors should also consider the performance track record and service standards of the mutual fund which are more important. Efficient funds may give higher returns in spite of loads. Mutual funds invest the money collected from the investors in securities markets. In simple words, Net Asset Value is the market value of the securities held by the scheme. Since market value of securities changes every day, NAV of a scheme also varies on day to day basis. The NAV per unit is the market value of securities of a scheme divided by the total number of units of the scheme on any particular date. For example, if the market value of securities of a mutual fund scheme is Rs 200 lakhs and the mutual fund has issued 10 lakhs units of Rs. 10 each to the investors, then the NAV per unit of the fund is Rs.20. NAV is required to be disclosed by the mutual funds on a regular basis – daily or weekly – depending on the type of scheme. 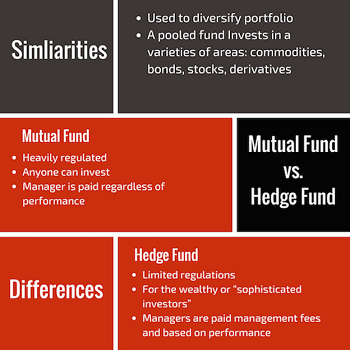 Hedge Funds are the investment portfolios which are aggressively managed and uses advanced investment strategies, such as leveraged, long, short and derivative positions in both domestic and international markets with a goal of generating high returns . In case of Hedged Funds, the number of investors is usually small and minimum investment required is large. Moreover, they are more risky and generally the investor is not allowed to withdraw funds before a fixed tenure. Assets under management (AUM) is a financial term denoting the market value of all the funds being managed by a financial institution (a mutual fund, hedge fund, private equity firm, venture capital firm, or brokerage house) on behalf of its clients, investors, partners, depositors, etc.